We talk about 3D printing a lot here at Geek Beat. It’s one of the fastest growing, and in many ways, most interesting fields of technology development. The day-to-day utility of object printing was demonstrated to us at the studio when, just before CES, we were able to print a replacement for a broken part on one of our camera rigs, saving a lot of time and money. 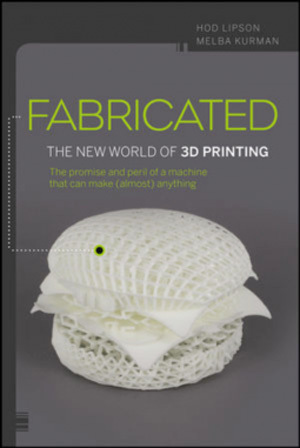 Fabricated: The New World of 3D Printing, by Hod Lipson and Melba Kurman is a new book that does an admirable job of tackling that ever-growing subject . While it may seem limited to get information on such a dynamically advancing field from the fixed point in time of a book, Fabricated covers the various points of the subject well, and would be a great subject primer for people who either don’t spend all their time on technology blogs and subject matter forums, or those who aren’t online search virtuosos. Even those who try to keep up with new developments are likely to find a lot here they haven’t previously known or considered. The first couple of chapters describe the ways in which 3D printing may be integrated into our lives in the future, and lay out the book’s ten principles of 3D printing. These are the fundamental ways that this new form of fabrication differs from existing manufacturing technologies. A few examples are the fact that complex forms are no more difficult to create than simple ones, items of different shapes can be intermittently created without changing the production equipment, and the devices that do the fabrication can often be quite small and portable. Later sections describe the different ways the technology is already being employed in areas as diverse as education and food preparation. Photos throughout show examples of both the kind of mechanical object fabrication we’re used to seeing from 3D printing, and some things that are bit more unusual, like printed shoes and clothing. Do you know the difference between “analog” and “digital” fabrication materials? That’s touched on near the end, and after reading it, you’ll be ready for the word “voxel” when it enters mainstream conversation. Fabricated is an excellent book to give to a friend, family member or co-worker who has heard of 3D printing, but may not know many details of how it works or what it can do. But it’s also an interesting read for people who keep up to date on technology. Unless 3D printing is your profession, or personal passion, there are likely to be a lot of things here you haven’t heard or considered. It’s highly recommended if you have any interest in learning more about what will probably become one of the most common, yet important technologies of the next few decades.